For longtime Taiwan is not hiring migrant workers for Dairy Farms works. But as of this Wednesday, the Ministry of Labor had announced that the country is now open for a trial basis as part of their effort to solve the issue of the labor shortage. If a dairy farm has eighty cows then the employer should hire 4 locals and 1 migrant worker only. According to Tsai Pei-chun, executive secretary at the COA's Personnel Office. This is part of the initial stage plan. 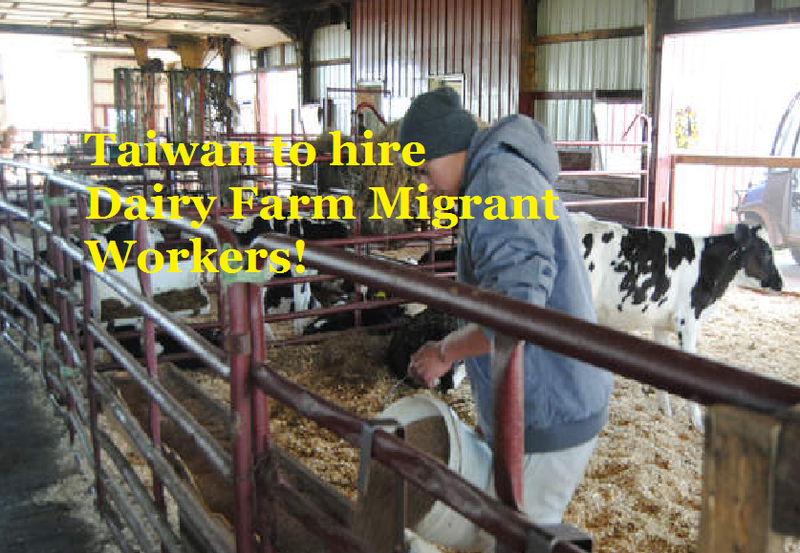 One reason that urges them to come up to hire migrant workers because previously they launched hiring for dairy farm workers and out of 90 applicants, only 20 accepts the job with starting salary of NT$40,000 but unfortunately none of them remain. Locals are also reluctant to accept the job because of heavy workload and afraid to huge animals. By launching this project it is expected to hire 400 migrant workers. willing to work for dairy farm.how and what agency. Im here in taiwan right now filipino ocw.. Looking for a new job and im willing to apply. what are the qualification in this job offer? Pano po mag aplay willing po ako.